OptimalSensing is a research-focused company developing new algorithms and hardware that work in tandem to observe phenomena that are not observable with existing technology. The primary application area is currently (scanning) transmission electron microscopy (S/TEM). Many of the most important processes in materials engineering and biology/medicine occur by the movement of atoms—such as the storing of charge in Li-ion batteries and drug interactions with cells to cure disease. Understanding and controlling the way that atoms move will lead to new technologies that address the major global challenges of energy, defense, and human health. The ability to see atoms as they move is a key enabler for understanding and control of materials and biological processes. Although aberration-corrected S/TEM can routinely acquire atomic resolution images, these images typically require a large radiation dose applied under extremely stable environmental conditions. Atomic resolution is currently achievable in a small set of very expensive facilities worldwide and limited to the analysis of a few very stable types of static inorganic structures, such as metals, insulators, and semiconductors. The goal of our research is to expand the set of specimens/processes that can imaged at atomic resolution (especially for organic/biological materials and fast chemical reactions), and enable precise, rapid, and automated sensing from the rudimentary-level (e.g., auto-focus) to the meta-level (e.g., adaptive and optimal study planning) by developing new machine learning techniques. A diagram showing the interplay between the experimental and sensor settings shown in the Figure. This cross-disciplinary research synergizes the physics of microscopy (i.e., radiation damage and optics) with advanced sensing/signal-processing techniques and machine-learning/artificial-intelligence. Figure. 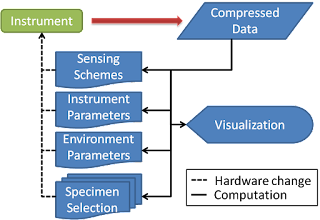 Diagram of automated and adaptive scientific imaging/sensing. The instrument could be a S/TEM or another sensor (e.g., mass spectrometer). The feedback loops are nested and the computing arcs produce artifacts useful for subsequent loops and post facto analysis. The feedback loops shown in the Figure are each their own research areas. Recently introduced advanced sensing schemes for S/TEM will enable automated parameter calibration across the multiple feedback levels in an experiment. This is possible because of the reduction in dose (specimen damage) and acquisition time enabled by compressive and adaptive sensing. At the innermost feedback layer, the sensing scheme can be optimized to produce the best possible images at the lowest possible dose. Moving up in the hierarchy, environment parameters (e.g., temperature) can be controlled to obtain desired material-growth properties (e.g., nanoparticle nucleation rate), but this also depends on instrument parameters (e.g., beam current) and sensing schemes (e.g., % of pixels collected). The outermost loop, specimen selection, could also involve switching instruments if the current imaging modality is not able to extract the necessary information or if complimentary modalities are needed.